One of the last things you’ll find going down Broadway in downtown Los Angeles is an actual Broadway show. From Third to Ninth Streets, Broadway is home to the country’s largest collection of aging, ornate prewar movie palaces and theaters. The exteriors bloom with architectural flourishes and golden-age glamour, but most are nothing more than defunct temples of nostalgia as they loom over what is now L.A.’s jewelry district. Atop one of these old, movie-less theaters—the old State Theater to be exact—is the office of a toiling former Marine named Matt Booth who makes jewelry and cigars. 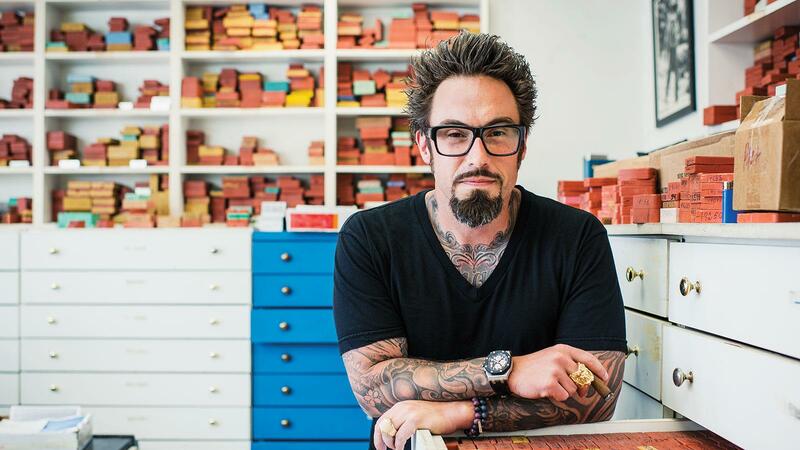 He’s the creator of a fashion-forward line of heavy silver jewelry called Room101 (after Orwell’s 1984) and the father of a cigar brand with the same name. Both the jewelry and the cigars are cast from Booth’s experiences overseas while deployed in Japan and are influenced by Japan’s iconic and mythological imagery. While his jewelry is made in a small foundry down a film noire-ish hall on the other side of the same building, his cigars are made in Honduras at the Camacho factory and distributed by Davidoff of Geneva in Pinellas Park, Florida. Unlike Davidoff or Camacho cigars, Room101 adopts an unmistakenly Japanese motif in its packaging: Sheer. Clean. Mysterious. Booth’s office space looks like something from an old detective movie. The hallways still have the original flooring, the ceilings are high and the large windows offer extraordinary views of other old buildings in the neighborhood. With the exception of a few minor updates, the interior looks much the way it did 60 or 70 years ago, retaining many of the original fixtures. The 37-year-old Booth walks these halls as a modern contradiction to his surroundings. He’s tattooed on most of his body, wears different colored sneakers on each foot and sports the type of spiny hairdo you’d see in modern Japanese animation. In this vintage setting of solid plaster walls and prewar wiring, he is the anachronism. “I wanted to import the Japanese flavor so prevalent in my jewelry to my cigars,” Booth explains. “And I wanted to use words with a strong meaning.” One of those words was Namakubi, which, according to the lore of Japan’s isolationist history, was a severed head presented after battle as a trophy to the leader of a winning group of warriors. It’s also the name of a five-size line Booth introduced in 2011 that has been well received by cigar smokers. It’s his third official cigar brand and emblematic of his passion for Japanese imagery. Booth puts a black box of Namakubi cigars on his desk and then opens it somewhat ceremoniously. The lid comes cleanly and completely off the top. Inside are 50 small petit coronas standing upright like a battalion of feudal figurines packed tightly into a mini shogunate naval ship. The lid is emblazoned with the image of a Fu mask, the mythical lion-dog guardian. In Japan, the lion-dog is referred to as Komainu. This whole conjuring of a Namakubi cigar from its box—between the removal of tissue paper to the unfurling of ribbons to the imagery on the lid—is a bit of Kabuki theater. Or perhaps Noh theater, famous for its dramatic masks. It’s understandable that Booth would feel this way. When a Westerner decides to commercially adopt images of the East, there’s always the chance that he or she will be dismissed, whether fairly or unfairly, as being superficial and exploitative with little to no cultural understanding of the subject matter. Booth approaches his Japanese motifs with thoughtfulness and respect. They appeared on his jewelry first, his cigars afterward. Strategic cross branding? Booth admits that it certainly started out that way, but it didn’t take long before he developed a serious and sophisticated passion for cigars. When considering the story of Booth’s life so far, he seems to have spent much of the millennium’s first decade as a modern-day ronin. A four-year military career with the Marine Corps took him to Japan and Southeast Asia. After he finished his service and left the Corps in 2000, Booth returned to California and started to dabble in security and sound engineering in and around Los Angeles. He eventually met famed L.A. jeweler Guillaume Pajolec, who specialized in silver jewelry. Booth became a client of Pajolec and created some personal pieces for himself by mixing and matching some of Pajolec’s existing patterns to his own specifications. When Booth wanted to design rings and bracelets from scratch, Pajolec introduced him to jewelry maker Rafi Oganesian, who later became Booth’s partner in the Room101 brand. To start, Booth literally took his products door to door. He visited trade showrooms throughout L.A.’s fashion district and introduced his wares to designers and distributors that were well regarded in the industry. Hoping to gain more exposure, Booth brought his products to fashion trade shows, but he realized he had a problem. He was trying to position his jewelry as a luxury lifestyle product, but found that presenting his pieces in such a modest booth posed a direct contradiction to the image he was trying project. In other industries, the size of a trade show footprint might not have mattered as much. In fashion, the perception of success is far more important. While planning the event and seeking sponsorship, the club manager introduced Booth to Dylan Austin, who was the director of marketing for Camacho Cigars. “Dylan came and brought 1,000 cigars—Camacho Liberties, Scorpions and Triple Maduros. Every single person at the Ghost Bar was smoking. That night, I smoked a Liberty and a Scorpion and I thought ‘Aha!’ Seeing everyone smoke was confirmation that cigars do indeed complement the luxury lifestyle. I got to know Dylan and he asked me if I wanted to do a cigar with Camacho. In the midst of hammering out a deal with Camacho, something happened unexpectedly—Camacho was bought out by Davidoff. It was surprising to Booth, but it had little affect on the terms of his agreement with Camacho. Furthermore, he was enthused to be associated with Davidoff, a company with a luxury lifestyle philosophy that he’d always admired. The cigar was a blend of Honduran and Dominican tobacco with a Honduran-grown wrapper that Booth says was a hybrid strain of Dominican and Honduran seeds. It was called Room101 and debuted at the 2009 International Premium Cigar & Pipe Retailers trade show. Booth came to the show with samples of his new brand, and they made a good enough impression to secure several orders. But issues arose when the customers began receiving shipments. “What they ended up receiving was not the same cigar as the samples they first tried,” says Booth. “Not only was it not the same, it wasn’t even any good. They either had burn issues or were bitter, or both. I got all the negative feedback from the irate cigar-store owners who told me how it was totally different from what they first smoked at the show. More amused then dismayed, Booth recants this mishap with far less cynicism than would be expected. He even chuckles a bit as he thinks back and recites the memory. “Corrected itself,” he says again, and shakes his head. Although it could have destroyed him as cigarmaker, Booth’s droll nature allows him to laugh off the past with the tidy ease of a Zen proverb. As he remembers, the next container of cigars to arrive were better than the nearly unsmokable cigars that were originally released, but they never matched up to the original blend of his first production and Booth now had to undertake the task of damage control to salvage his young cigar brand. Part of the reparation process was to really dig in and learn cigar production. He also traveled extensively and personally built more relationships with retailers and smokers alike. Booth’s next project was called Room101 Conjura Ltd. Although it only had a small production run of 40,000 cigars, he was much more involved in the process, taking a larger role in blending and trying to be more of a presence in the factory. These cigars were box-pressed with a Sumatra wrapper that enveloped Honduran and Dominican tobacco. Two of the sizes scored 93 points in Cigar Insider, the cigar industry newsletter from Cigar Aficionado. “I had a lot of help blending the Ltd. line, but I was also more confident in the process,” says Booth, who, by this time, was at the factory on a monthly basis. For his next release, Booth was finally able to seriously synergize the Japanese motifs of his jewelry with his cigar packaging. He had a tattoo artist create specific lettering and a logo analogous to his existing jewelry designs, and then printed the artist’s work onto a sheer black box. This was the Namakubi brand. It’s billed as a limited edition, but in this case, Namakubis are made each year, just in limited quantities. The line was blended around a criollo wapper from Honduras, complemented by a Honduran binder and filler from Honduras and the Dominican Republic. It was released in 2011 with a first production run of 150,000 cigars. Now, the factory produces 350,000 Namakubis per year, not counting the Namakubi Ecuador, a brand extension that hit the market in 2012. These are rolled with Ecuadoran wrappers. Booth says that anywhere from 250,000 to 350,000 Namakubi Ecuador cigars are made each year. Delving deeper into Japanese culture, Booth released the curiously named Room101 Daruma, which he refers to as the cousin to Namakubi. “The Daruma doll is significant in Japanese culture. It symbolizes perseverance. You paint the doll’s eyes as you progress in whatever task you undertake. When you finish the task you paint the other eye. After all is finished, you burn the doll and get another one.” The stylistic similarities between Namakubi’s packaging and Daruma’s are undeniable, and Booth intended it to be that way—he enlisted the same artist to design the lid art. The Daruma blend is even made with the same Ecuador Habano wrapper, but the interior tobaccos differ. In the company’s first year, Booth says that he was producing around 200,000 cigars. By 2012 he hit the million mark and now, he consistently produces more than 1 million cigars annually. It should be noted that although Davidoff manufactures Room101 cigars in its Camacho facility—and distributes them out of its Florida warehouse—the brand is owned by Booth, which gives him creative freedom. If Davidoff is shouldering the distribution of Booth’s product, then this can only mean that the sales force is out of his control. Room101 cigars are a small part of the much larger Davidoff portfolio, which counts more than 20 lines in its repertoire if you consider all the different types of Davidoff, Avo and Camacho cigars alone. In situations like this, there is always the chance that a brand could get overlooked or marginalized—different sales people are naturally going to push different lines. Booth shrugs. So far, the strongest creative inspiration has come from the orient, though most cigar smokers who inhabit the occidental world might have trouble identifying something like a Daruma doll (let alone a Namakubi head). In a recent release, Booth incorporated a far more familiar Eastern symbol onto his Master Collection cigars: the cherry blossom. Called sakura in Japanese, these minimalist cherry blossoms grace the lids and bands of his Master Collections One and Two. Out the window, the sun has started its late afternoon descent over Los Angeles and the oblique angles of the evening light are bringing out the charmingly ruddy details of all the old buildings. Ghost signs painted onto peeling brick facades advertise businesses long gone. Down the hall, Room101 jewelry is cast from molten silver in a small manufacturing operation on the same floor. The office door opens. It isn’t Sam Spade or Jake Gittis, but Booth’s partner, Oganesian. He pops his head in through for a moment and then leaves, receding back to the foundry.